Home / Anime / Cosplay / Hibari Kyoya / Manga / I Choose Hibari Kyoya Cosplay! I Choose Hibari Kyoya Cosplay! I choose Hibari Kyoya as my cosplay character for our company costume party. 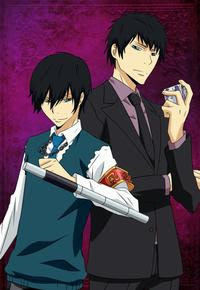 Hibari Kyoya is a character for the manga/anime, Katekyo Hitman Reborn! Hibari Kyoya is head of the Namimori Middle School Disciplinary Committee and is a violent delinquent who uses his status to harass other students. Hibari prefers to be alone and cares little for his subordinates. Kyoya’s catchphrase is "I'll bite you to death" (kamikorosu), which he says to everyone whom he is ready to fight. Hibari is very proud of his school, and is apparently the only person who likes their school's anthem, even using it as his ring tone. It has been noted that Hibari is exactly like the first Vongola Cloud Guardian. The first Cloud Guardian had been the head of a country's secret intelligence division, never stood alongside the Family, hardly got along with anyone, and preferred being alone. However, he and Vongola Primo had one thing in common that allowed them to work together, in that they defeated the most enemies and were benevolent to comrades. Hibari's tonfa have also been shown to have hidden compartments containing other weapons. In the future, he has a box weapon which contains another pair of tonfa which emit Dying Will Flames. The Hibari Kyoya version I chose to follow is the Adult/Future version. The next post will be showing the event/cosplay itself of Hibari Kyoya (Future/Adult)! So make sure to be disciplined when you are in my presence, or else, I will Bite you to Death!